I shared that I was giving our dining room a little makeover and that makeover is now also moving into the kitchen. It is another domino effect where you start one thing and then can’t end it there. I’m giving you a peek at what is going on with my lower cabinet situation and the accompanied budget kitchen updates I have been working on. This has created a big division between folks on Instagram and Facebook. Mostly everyone on Facebook said “don’t paint the lower cabinets” and on Instagram, almost everyone said “paint it”. But you see my cabinets really have to get painted again. The upper cabinets are yellowed from cooking and the lower cabinets are disgusting and worn down as you can see in the photo below. Fact is that I always wondered what my lower cabinets would look like in a different color. So I thought now or never. I would have really liked to reface my doors and drawers but that’s not in the budget for now. Maybe one day and then I will go back to white for sure. 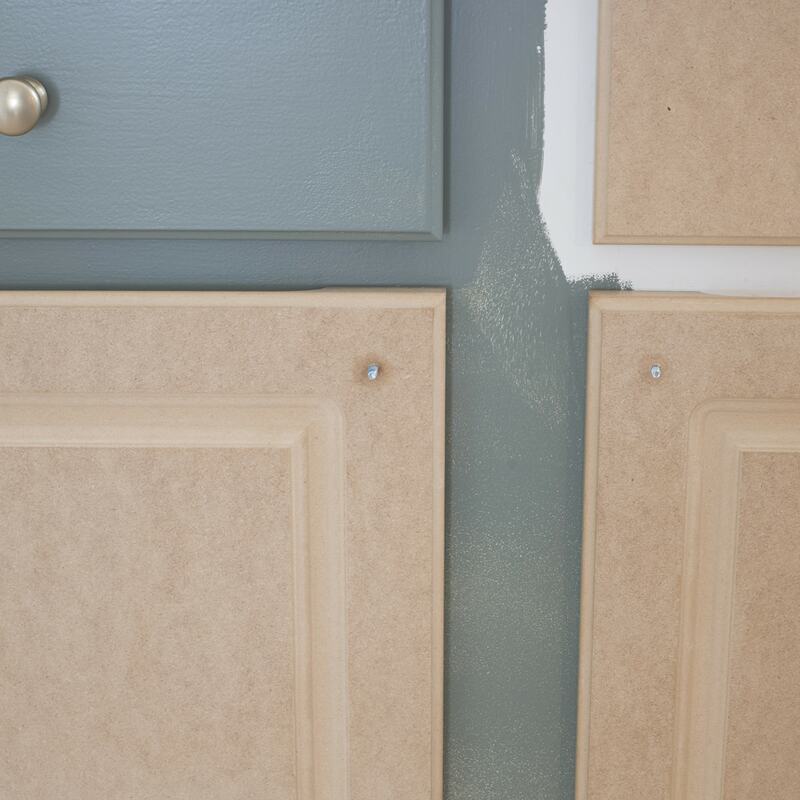 Some of the cabinet doors were not peeled yet and my daughter and I peeled them, so I can paint them as well. If you are new here, I peeled, primed and painted some of the broken cabinet doors and drawers which you can read about HERE. Since the white that I painted them with matched the laminate paint, I didn’t have to do all of them which was nice but now that I’m going with a different color, I have to finally peel all of them. The painting might take a little longer than usual since the temps are so cold outside. 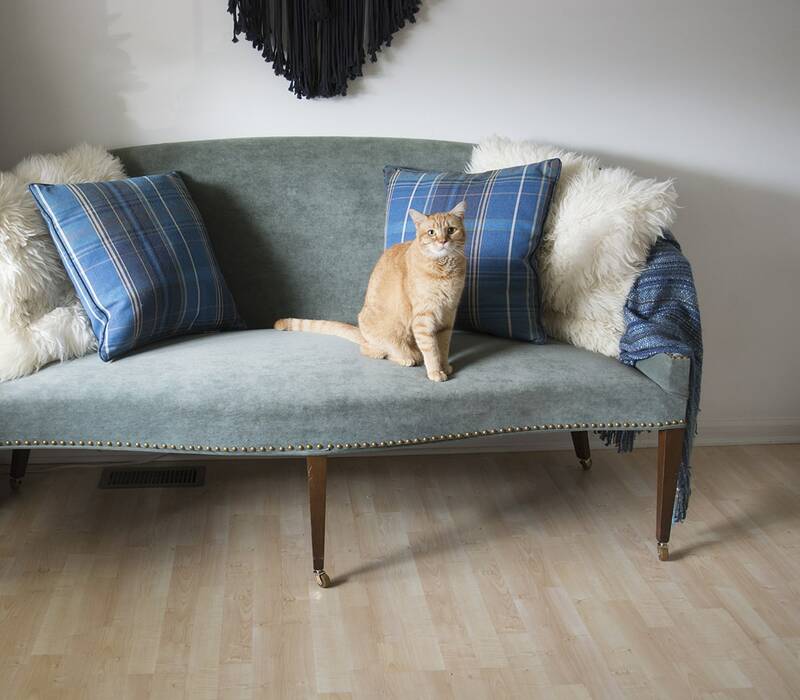 My love for my antique settee that we have in the dining space right next to the kitchen island and cabinets made me decide what to paint the cabinets. It isn’t the exact same color because I didn’t want to be matchy-matchy but it compliments it very well. I had contemplated going black but I decided to go outside of my normal comfort zone. And my mom might have given nme the nudge to do so. So I’ve also been organizing, rearranging and fixing other things in the kitchen to make it more functional and organized for us. And today I wanted to share with you what I have found on a budget. I mean I would love to just go all new but that’s not an option. Drawer Divider Organizer (HERE): These dividers can be used in a variety of drawers to separate utensils or other items and are for people like me who can’t use number 4 in their drawers. Cork Shelf Liner (HERE): I’m tired of my plastic liners and how yucky they always look so I’m trying out a natural product that looks a lot prettier to me. This paired with the bamboo dividers above will be functional and pretty. Slide Out Cabinet Organizer (HERE): This item has been on my list for a very long time. I love the custom wood slide-out drawers in new high-end kitchens you see everywhere but I can’t afford them, so these organizers are a great comparable option. 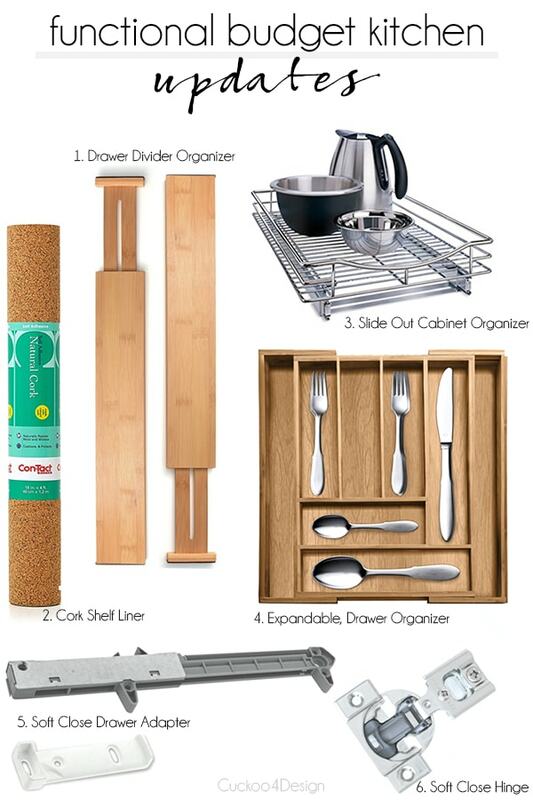 Expandable Drawer Organizer (HERE): I really wanted to use these expandable organizers for our kitchen but our drawers aren’t wide enough so I have to settle for 1 and 2 in my roundup. If you do have drawers wider than 10 inches (yup mine are tiny) then these are perfect. Soft Close Drawer Adapter (HERE): I really wanted to buy new sliders for our drawers because I’m sick of my family slamming the drawers which also ruins the paint job where the drawer slams against the cabinet frame. But those types of sliders are so expensive! I found adapters that you can add to your existing drawer sliding hardware for about $12.99. So much cheaper. 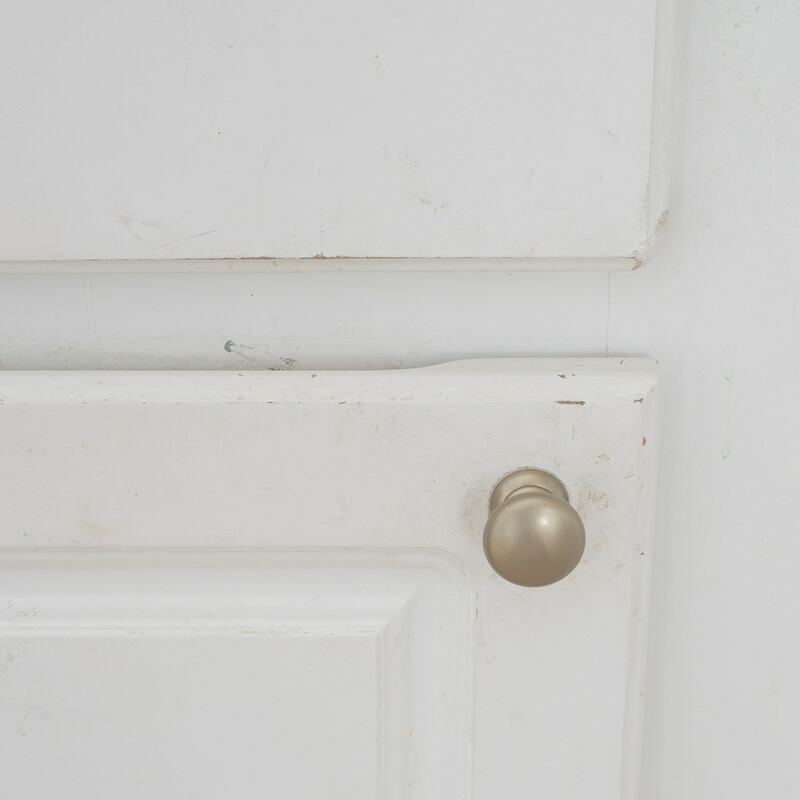 Soft Close Hinge (HERE): Speaking of slamming cabinets, I also added soft close hinges to our cabinet doors and I love them. The ones I have specifically match my cabinet overlay and size which will most likely be different for everyone else. Some of the items are on order and I’ll install them soon. Can’t wait! Do you like adding functionality to your home or do you mostly try to just add visual things like decor to your home? I know I struggle with this all the time because the home decor is instant gratification since you can’t see the functionality. So a lot of time it is on my back burner. When I finally tackle these types of projects, like adding the coasters to my dining room settee (HERE) then I wonder why I waited too long. Ooh they’re going to be gorgeous Julia! Lovely colour!! Thank you Catherine! Have a great weekend. I am loving what I’ve seen so far! Great job. Thank you Nancy! I better get working and get it all done. Great color! I take back what I said about leaving it white. BTW, I bought a macrame wall hanging from Home Goods on clearance for $8.00! Thanks for the inspiration if macrame! Oh and I’m glad you like your macrame wall hanging. Love the color! We HAD to re-do our kitchen as it hadn’t been updated since 1973 when the home was built. (We bought it as a foreclosure). Our back splash and counter tops were avocado green. We couldn’t afford to custom order everything, so ordered stock white cabinets from Lowe’s and made it work. We also got all new appliances- basic white. We did a white subway tile back splash and the floors were done in a plank style peel and stick laminate. We did the whole kitchen for less than $5000.00. The tile work cost $600.00 of that. It’s not my dream kitchen, but it’s beautiful and functional and so bright and clean. LOL and I’m going back to avocado green. Oops! You did such a great job on your kitchen. Not sure why anyone would not love the painted cabinets? They are gorgeous! Oh good to know that you love them! LOVE IT!! TH PAINT COLOR IS PERFECT! 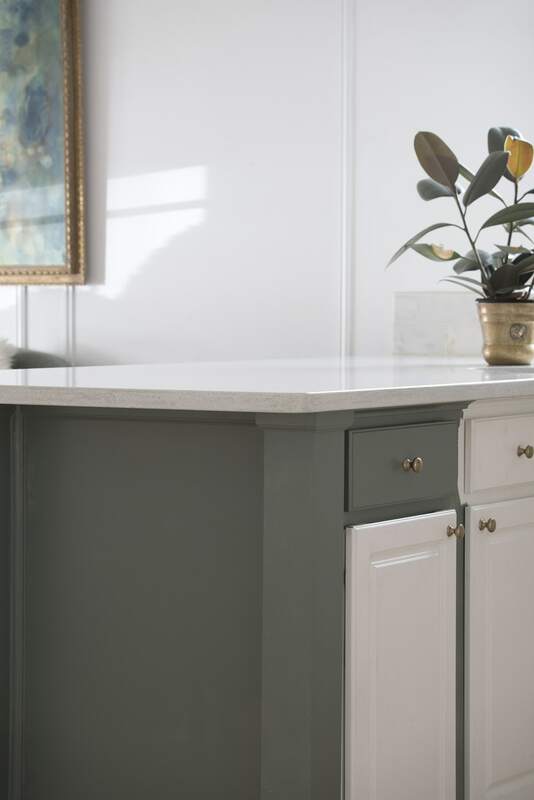 Love the cabinet color-what a nice change!!!!! Thank you so much, I’m loving the change too and the paint only cost me about $40, yay!